It is vital to understand the public health impact of pesticides used in modern day agriculture. Unfortunately, scientifically valid information is often scattered and hard to find. Proceedings from the Medical Workshop on Pesticide-Related Illness is the essential text that fills these two voids. The papers collected here make up a volume that is a timely review of key issues in both the acute and chronic health effects of pesticide exposure. 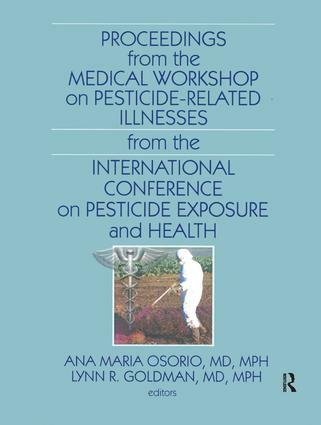 Proceedings from the Medical Workshop on Pesticide-Related Illness offers work originally presented at the groundbreaking 2002 International Conference on Pesticide Exposure and Health in Washington, DC. However, in order to reflect recent developments in the field, all of the authors have revised, updated, and expanded their presentations to address the current status of knowledge in pesticide health effects upon the major body organ systems. This up-to-date reference not only provides a wealth of relevant information on pesticide intoxication, it also offers viable solutions to the challenges of understanding the effects exposure has on health. Proceedings from the Medical Workshop on Pesticide-Related Illness also includes valuable appendices that provide readers with a list of additional information sources, pesticide intoxication reporting forms, and the pesticide poisoning severity score (PPSS). This is an essential resource for health care and public health practitioners, occupational health professionals, and governmental employees dealing with the environment. Ana Maria Osorio, MD, MPH, is a Medical Officer in the U.S. Public Health Service and the Regional Medical Officer for the Pacific region of the U.S. Food and Drug Administration. She is board-certified in Occupational Medicine and has an MPH in Epidemiology. Dr. Osorio is the author of numerous book chapters and journal articles dealing with various aspects of environmental and occupational medicine. Her research topics include agricultural worker health, environmental pulmonary hazards, tribal medicine, cancer workplace risks, adult and child lead intoxication, public health disease monitoring systems, and international public health issues. Lynn Goldman, MD, MPH, is a Professor at the Johns Hopkins University Bloomberg School of Public Health, a pediatrician, an epidemiologist, a Senior Research Fellow in the Johns Hopkins Office of Critical Event Preparedness and Response (CEPAR), and a Principal Investigator for the National Center of Excellence for the Study of Preparedness and Catastrophic Event Response, (PACER). Her research interests include environmental epidemiology and surveillance, chemicals policy, disaster preparedness, education and training, and children’s environmental health. Dr. Goldman has published widely in numerous professional journals.